Life’s been busy lately, so posting has been light. For some time, though, I’ve been working on a list of “things I’d do if I was completely in charge of adjusting the government.” They center around limiting the influence of lobbyists, making immigration offenses a serious matter, and reducing the ability of a president to unilaterally commit the nation to war. It’s an ongoing project. But I’ll post it here for any comments and input on what’s already there. Warning: it’s a lot of stuff (roughly 6 pages in a word processor). But then, there’s a lot of stuff wrong with the country, so that’s to be expected. Use the page numbers at the bottom of the post to advance to the next page. No person convicted of a felony will be eligible to hold elective office at the Federal Level. Convicted felons may not serve in the Federal Civil Service above the grade of GS-5. The Legislatures of each State will appoint one person to serve on a Federal Civil Service Oversight Board. Board members will serve terms determined by their individual State. This 50-member board will have power independent of Congress to investigate accusations of fraud, waste, abuse, or employee misconduct/failure to meet standards within the Federal workforce. The board, by a 3/5 majority vote, may dismiss any federal employee below the grade of Cabinet Secretary. The board will also investigate charges of retaliation against whistle-blowers. With the concurrence of 3/5 of the board, anyone deemed as having engaged in retaliation will be dismissed from Civil Service. No person dismissed by the Oversight Board will be eligible for any future Civil Service position or for elected office to Congress or the Presidency. That’s how many people are known to have illegally crossed the U.S. border “in recent months” and been allowed to stay…. with the Federal Government transporting them throughout the country with open arms. And now the town of Murietta, California, is being portrayed as some sort of eeeeeeevil group of people. According to the New York Times article, Murietta “has not been as transformed by immigration as many other communities in Southern California have,” ((how dare they?)) and residents had the audacity to block the busloads of invaders (lets call them what they are, please) Uncle Sam apportioned to their community. Supposedly, our nation just celebrated the anniversary of the date we withdrew consent from a government that was injurious to our freedoms, and set about forming a new one. In reality, most Americans simply enjoyed their time off work, overate at barbecues, spent money they didn’t have on things they don’t need, or watched fireworks from a safe distance (instead of creating some much needed ones like the residents of Murietta did). It wasn’t a celebration of freedom… it wasn’t even a contemplation of it or what it takes to sustain it. – Uncle Sam is actively abetting a large-scale, ongoing invasion of this nation. Yes, they are fellow human beings bearing the imagio dei. So are members of al Qada and MS-13. I raise that fact because the first point is not the carte blanche excuse for erasing the border and letting just everyone in that activists portray it to be. Freedom of association is an important trait of a stable nation. The United States is no longer a stable nation. It is an unstable political entity made up of imported and non-assimilated polities whose determination not to integrate and competition for influence and resources only benefits our rulers. And let’s get another thing straight while I’m at it: I’m sick of activists comparing current events to the arrival of the Pilgrims and other European settlers. 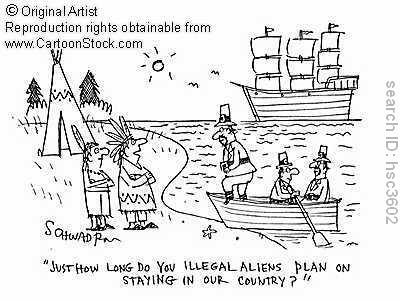 Did they dispossess the Native Americans? Yes… and these holier than thou people frequently point out the abuses that involved. But are you now saying two wrongs make a right? It sure seems that way. Be careful — your anti-Western civilization bias is showing. – The Federals are abusing virtually every power and trust, via every agency they have, and refuse to account for their actions. At least one writer was willing to ask the pertinent question this weekend. To which I reply a resounding “ABSOLUTELY.” Our government’s actions on multiple fronts no longer bear any semblance of legitimacy. And if voting them all out in November doesn’t fix it, then it’s time to look at remaining alternatives. I have come to strongly doubt, however, whether Americans are even serious about trying the first option, much less running the risks involved in large scale disobedience and refusal to comply. Make no mistake, either: as ‘law enforcement’ becomes ever-more heavily militarized, our days of being able to peacefully resist in force sufficient to actually change things are likely numbered. What would the Founding Generation do?